Etihad Airways & Jet Airways joint press conference in Mumbai ,which followed merely after hours of Tata SIA brand name announcement of "Vistara" was a very interesting event both in terms of briefings & presentations made & also in terms of body language of the Jet Airways Chairman, Mr. Naresh Goyal. Lets talk about body language first,will discuss presentation details later. 1.Mr. Naresh Goyal was very aggressive & full of confidence & made certain promises which were cheered by a round of applause from our friends in media too. 2. After making each promise he turned his head towards James Hogan as if conveying to him " Vaada mat tod dena,Izzat Rakhna types"
3. CEO designate Cramer Ball,is a smart man,kudos to his courage that he accepted " Multiple brands have confused our guests ". But in the end,this press event left us all with more questions than answers!! 1. What is meant by single brand strategy ? 2. Will only Jet Airways remain & Jet Lite & Jet Konnect will become history ? 3. Will Jet Lite,which is a subsidiary,be merged into Jet Airways ? Or Jet Lite will continue to be a separate company,with a separate AOP & a separate work force as until now & just word Lite/Konnect on aircraft"s livery will be replaced by Airways ? 4. Will all 11 Jet Lite 737"s be re-configured then to bring it at par with Jet Airways FSC product ? 5. Indian Aviation has seen 2 mergers,One was Air India & Indian Airlines,which is still caught in legal battle.HR issues,Pay Parity & seniority issues exists till date in Air India!! Second was Air Deccan being merged into Kingfisher Airlines,we all know what happened to KFA!! 6. If merger of Jet Lite happens into Jet Airways,will this crop up any HR issues ? How NAG Pilot union of Jet Airways react to it ? How will Jet Lite pilots react to it ? If every Jet Lite Pilot is asked to be at bottom most of the Jet Airways seniority list,APL,then will a Jet Lite Captain,Check Pilot,TRI,TRE accept being junior to a Jet Airways First Officer ? I highly doubt it!! 7. What will happen to 18 ATR"s of Jet Lite ? In yesterday"s PC there was no mention of ATR"s not even once!! We all know Etihad Airways is allergic to ATR"s & ATR doesn't figure in Etihad"s scheme of things for a feeder hub at Abu Dabhi,as an ATR cant fly beyond a certain range!! 8. Will all ATR"s be sent back in a phased manner ? 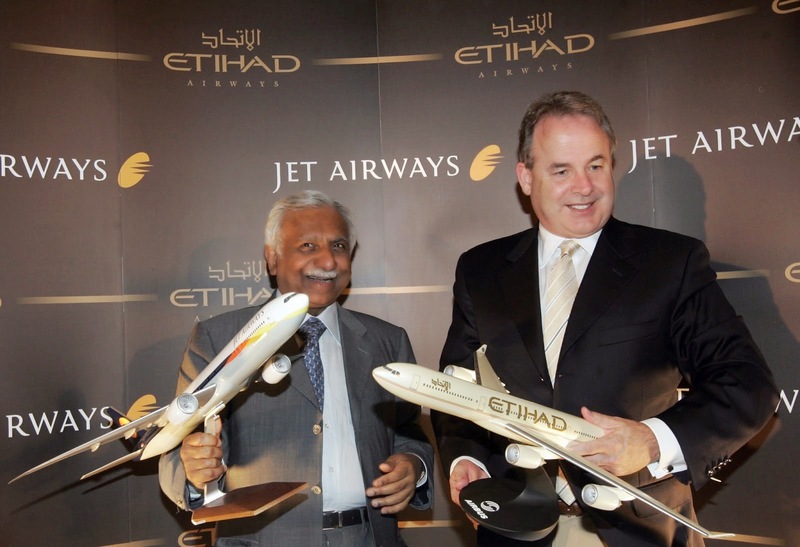 Has Etihad already set a dead line for same as rumoured earlier ? 9. If all ATR"s are sent back then what will happen to 200 odd Pilots of ATR fleet ? If they will have so many surplus pilots & also huge backlog of people to be trained & a handful awaiting joining post training from 2011 & 2013 CPL induction ( total around 200 ) then why is Jet Airways planning another round of hiring ? When will they be trained,join & released as an online First Officer,only GOD can tell!! 10. Mr. Naresh Goyal said "We are examining a possibility of a dedicated freighter carrier out of India"!! Will this also be along with Etihad via FDI mode as 100% FDI in a cargo airline is allowed ? Or will this be a sole Jet Airways venture on its own ? Indian Aviation is getting interesting day by day & many more surprises awaits us! !